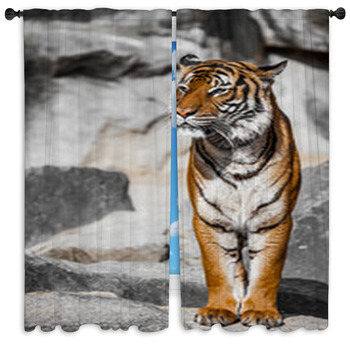 With our tiger window curtains, you'll give your family the feeling of protectiveness, but also danger, that seeing the most fearsome feline on Earth brings. 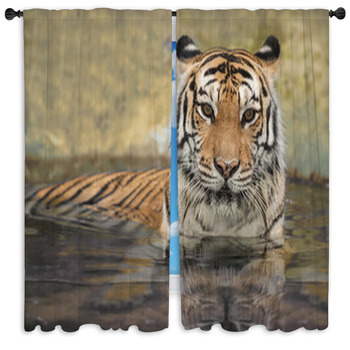 Choose custom size curtains that feature vivid color photographs of the massive heads and ferocious eyes of full grown tigers that will watch over your living room. 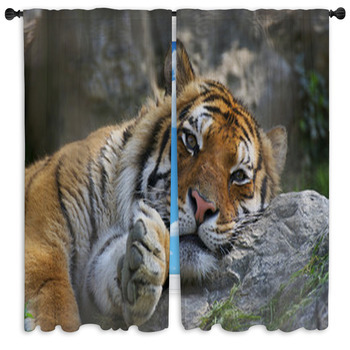 Then give your kids window curtains that depict friendly cartoon tiger cubs ready to play. 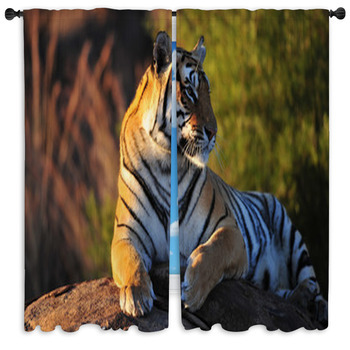 Select a window valence that exhibits one of the rarest and most beautiful sights on the planet, a white tiger. 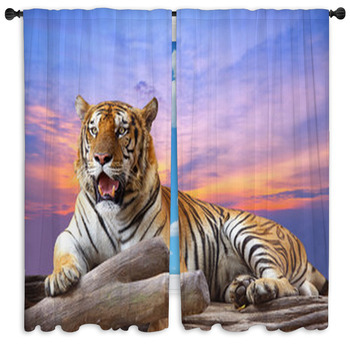 You'll feel like you could reach out and caress the smooth and creamy fur on this majestic beast when you see him prowling and grimacing on your window valence. 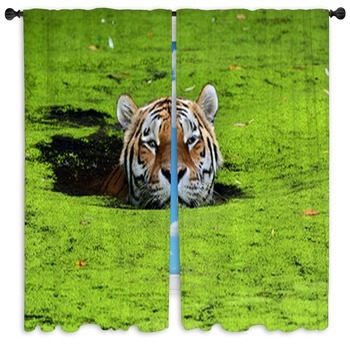 Then create a confident and aggressive atmosphere in your office with a set of drapes that showcase a menacing orange, black and white striped tiger marching straight towards you out of total darkness. 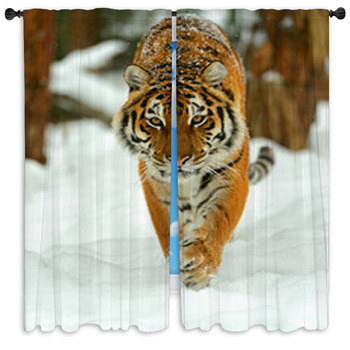 For your teen daughter's bedroom, we have tiger window curtains that depict a five month old tiger cub just learning how to use its huge and powerful body. This fluffy young tiger has tan paws, and fine stripes of black running through the white and tan of its face. 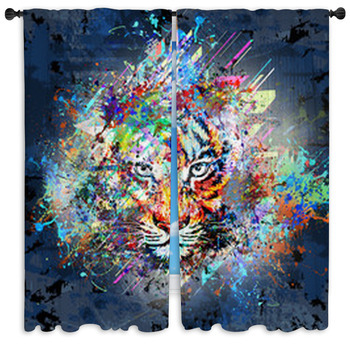 Your teen boy will be amazed by the intensity and coolness of custom size curtains that feature a stylized image of a tiger. 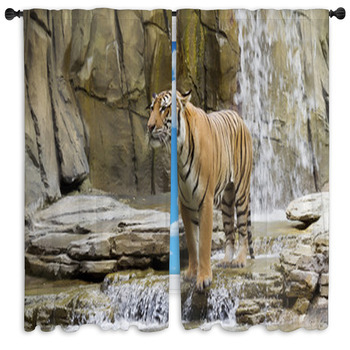 This illustrated tiger has reddish orange, yellow, white and black fur, with an abstract pattern of black stripes extending from his fierce face. 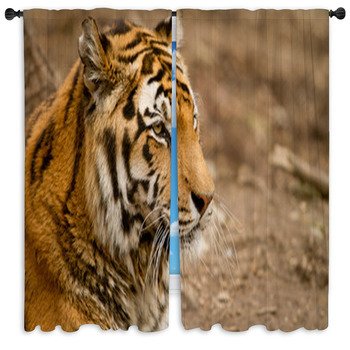 For little kids, go with our tiger window curtains that portray sixteen comic tigers posing in different stages of emotion and personality. 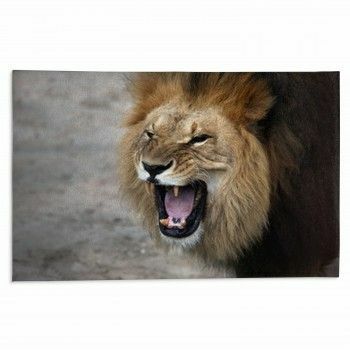 There is a tiger with loving red hearts in his eyes, while others are crying, laughing, growing old or being angelic. 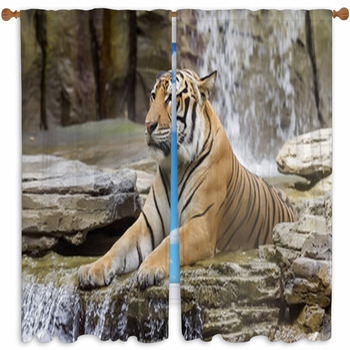 Honor the immensity and courage of tigers throughout your home by selecting our tiger themed bath decor and fabric as well.